Based on the fact that the screw coupling (Fig. 1) is still used in Europe for the majority of freight wagons, the operations at marshalling yards are not state of the art. All operations must be done manually by workers called shunters and this is a tough and dangerous task, especially the loosening of the coupling and the uncoupling process. Therefore a mechanical device shall be developed to do these tasks automatically to increase productivity and safety. 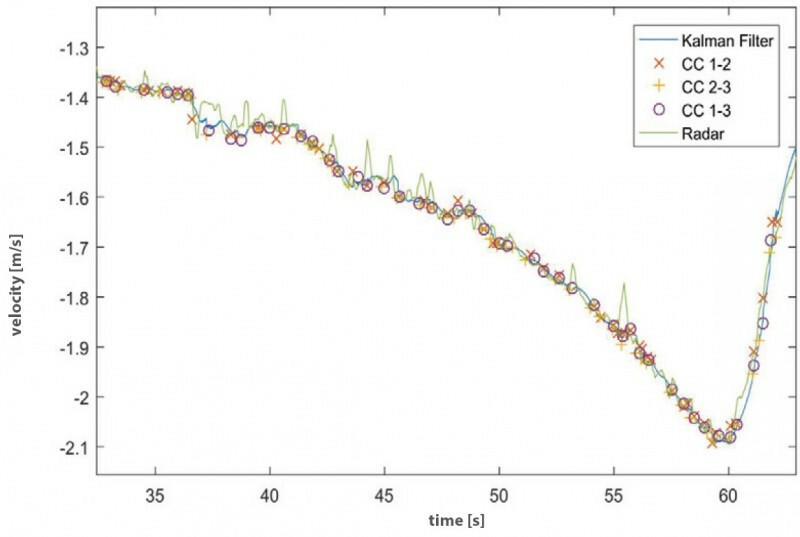 To archieve this, the complete process was analyzed and potential solutions were developed and tested. Also Lifecycle Management and the protection of workers had to be considered during the development process. Additionally, a sensor system is necessary to provide the required data for the control of the mechanical parts. However, an existing working solution was not available and therefore had to be developed and integrated. 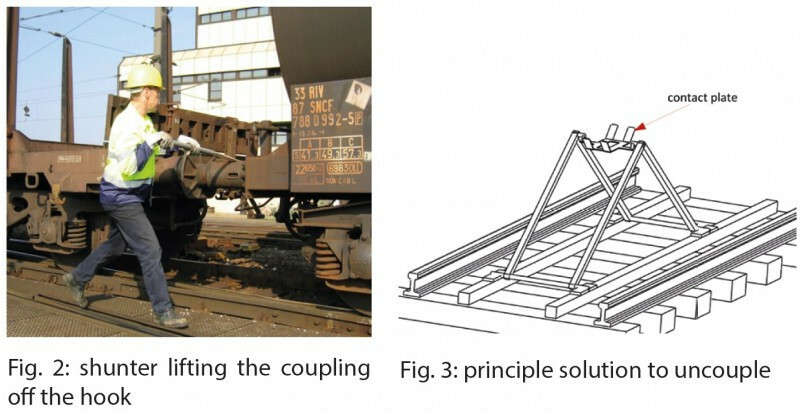 This complete solution has been tested in a laboratory model and furthermore the uncoupling will continue to be tested at the marshalling yard in Linz on moving rail wagons. To uncouple the screw coupling the coupling has to be lifted out of the hook. This can be done on moving or standing trains. The following solution deals with moving trains. Based on the toggle lever principle it is possible, with two cable drives, to accelerate the mechanism to train speed. 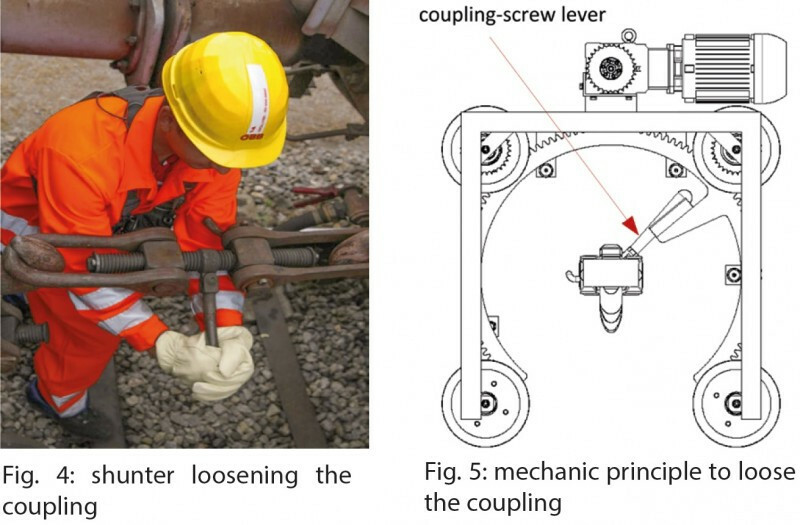 Once the top edge of the rail is in position, the coupling can be released from the hook. The uncoupling is only possible if the characteristic shape of the contact plate is used. This procedure is visualized in the images attached below (Fig. 2 and 3). This part of the separation process happens while the train is standing at the reception sidings. An opened gear ring makes it possible to put the mechanism over the coupling. The gear ring is subsequently moved in a rotary motion, takes the coupling-screw lever with a wedge manipulator and thus the coupling is loosened. This procedure is visualized in the images attached below (Fig. 4 and 5). A powerful and robust sensor and software system is essential to guarantee that the uncoupling will be done successfully. 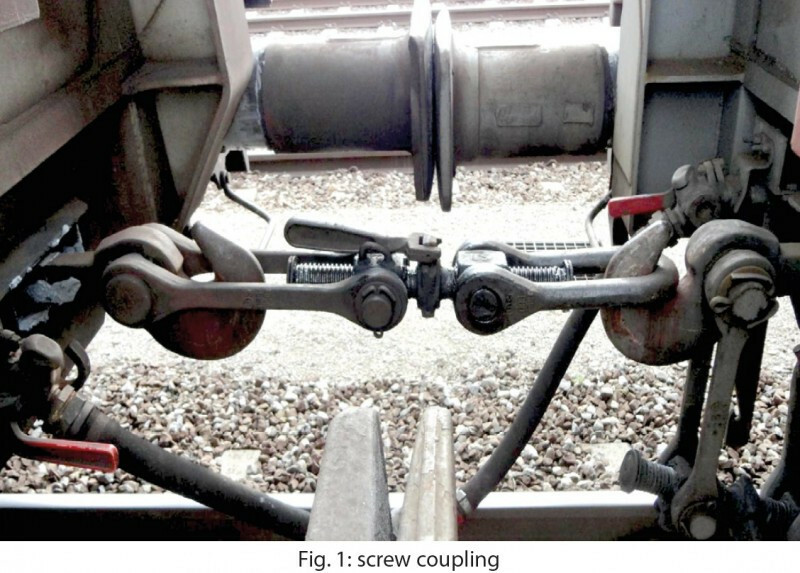 Beside other tasks this system detects the couplings on the train, it checks the state of the screw coupling and estimates their position. Furthermore it delivers information about the speed of the train in high accuracy. erent readings (see Graph below). 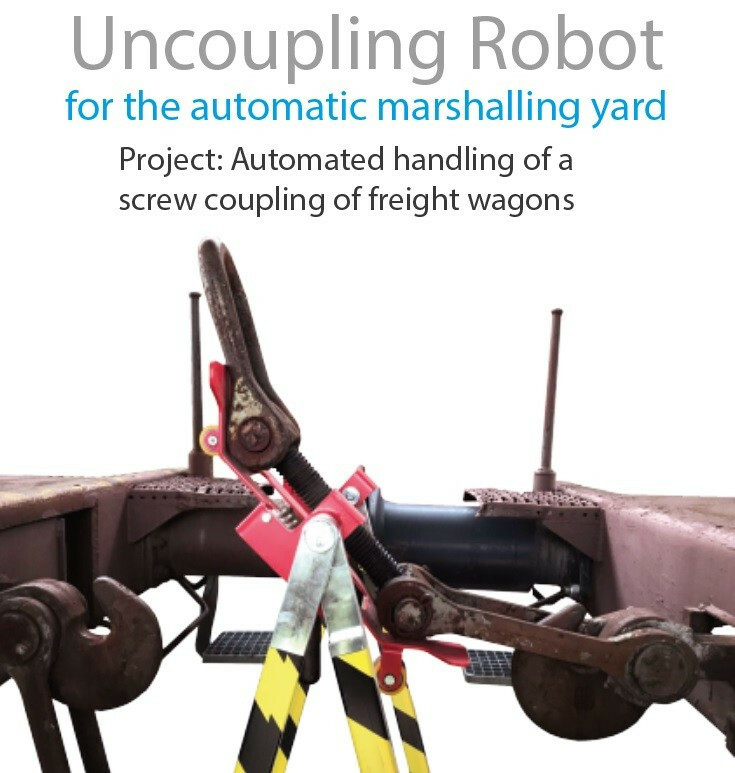 in order to produce a sustainable uncoupling robot afterwards. instructions. 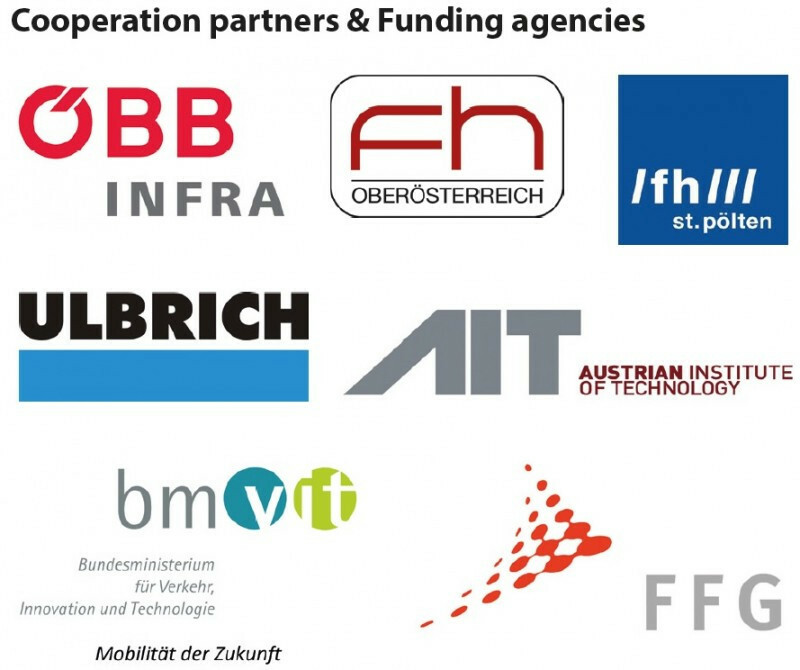 In order to take account of all relevant regulations concerning occupational safety of employees and safety of operational processes, these were transferred to the defined location for the test set-up in the marshalling yard Linz and were respected during the technical design and execution of the uncoupling robot (scheduling and provision of working spaces and clearence gauges or outlines, safe distances, etc. ).